Since its debut five years ago, The Great British Bake Off has become one of the most iconic TV programmes of the decade with audiences in the 2015 season reaching the heights of 10 million plus viewers. The finale of last year’s series was the biggest for a non-sporting event beating Sherlock, I’m A Celebrity and Strictly Come Dancing. The show has sparked a boom in home baking with supermarkets and chain stores recording rising sales of ingredients and accessories. 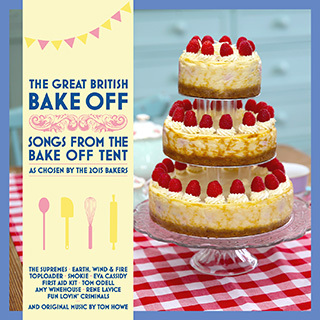 This outstanding collection brings together the music that the 12 contestants love to listen to whilst creating their culinary masterpieces, a wonderful a la carte menu that includes Amy Winehouse, The Supremes, Earth, Wind & Fire, Tom Odell and First Aid Kit. The release also features Tom Howe’s original and well-loved music that adds both tension and delight to the polished production.